I have been an Account Executive for MetLife for a little over two years, selling employee benefits through brokers to companies with 10 to 5,000 employees. I am in the process of moving from San Francisco to San Diego, currently living in Dana Point, CA. My fondest memory of my entire time at Oregon was running on the field the second the clock hit 0 at the 2012 Rose Bowl. We had lost our two previous bowl games, and the guys that were still on the team for the Rose Bowl had a huge weight lifted off of our shoulders when we won that game. It was the culmination of a pretty special season for us. Obviously work hard on the football side of things, but work even harder on the academic side and get involved with any networking opportunities that your school offers you. You never know what types of opportunities may come your way after your playing career is over, and the vast majority of guys will be done playing for good when your college eligibility is up. Always be positive. Your son is getting the opportunity to do what millions of kids only dream of doing- running on to the field on Saturdays for a college football game. You can’t take everything so seriously. I’m a firm believer that everything happens for a reason, so just sit back and enjoy watching your son have fun and grow up. I snap at least one ball a day down the hallway in my apartment just so I can tell myself- “still got it.” A lot of my brokers and coworkers ask me to snap a ball to them once they find out I played football as well. No doubt in my mind I would go to Oregon again. 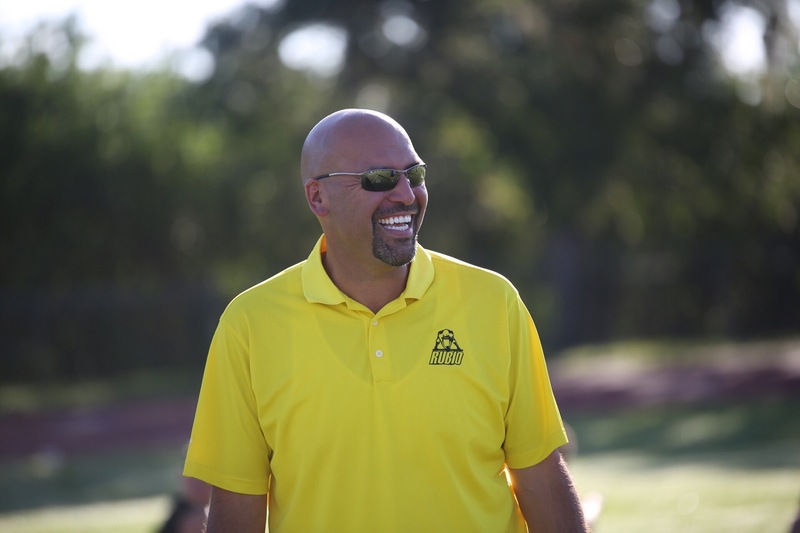 Everyone hears about Nike, the uniforms, the facilities, and the flashy offense, but what a lot of people don’t know is how well the Athletic Department sets its student-athletes up for success after their time runs out. There were countless networking and mentoring events to attend during our time there, which allowed me to develop relationships with people I otherwise would have never had the chance to meet. I actually wish I did not try to graduate as quickly as I did. I should have stayed in Eugene as long as possible because yes, being out in the real world is fun, but it comes with a lot more responsibility than you realize when you are still in school. I wish I didn’t have a girlfriend my senior year…what an idiot. I got to spend some time in Colorado working for Wounded Warriors right after I graduated. We spent time at Air Force Academy as well as the Olympic Training Facilities, but it was so rewarding helping the veterans and hearing their stories and about the daily struggles since returning home. It really put things into perspective for me. For the next installment of “Where Are They Now?” we venture to Seattle, WA (Go Hawks!) to hear from Rubio Long Snapper Brendan Lopez. Brendan was a top Long Snapper for Rubio Long Snapping in 2007. He started off as a preferred walk-on to Michigan but came back to University of Washington and was put on full scholarship! Check out what has been going on with Rubio Long Snapper Brendan Lopez…. 1. What is your current occupation? I am currently in my last year at the University of Washington School of Dentistry. I will complete my training in June 2016 and pursue further speciality training in periodontics. 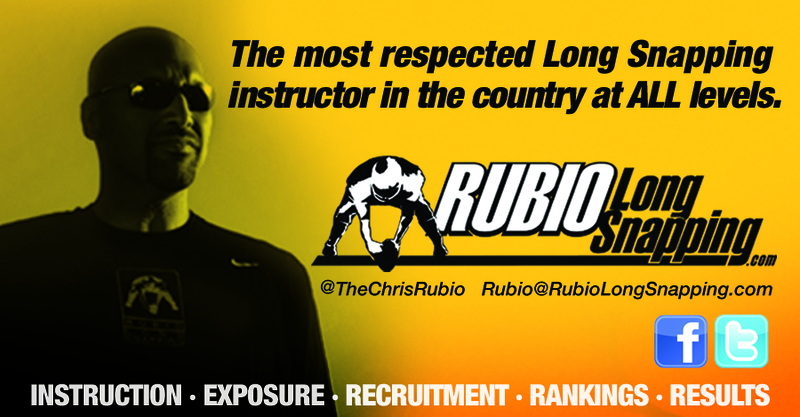 I am also a Rubio Long Snapping staff member for the Seattle, WA area. 2. Where do you live? Seattle, WA. 4. What is your fondest memory of your time playing college football? Spending time with my teammates. Whether is was during off season workouts, fall camp, traveling to away games or celebrating after a big win, the best part of college football were the friends and relationships that came from it. 5. If you could give ONE bit of advice to the current Rubio Long Snappers, what would it be? Be patient, enjoy the process and have a good life balance. Maintaining other areas of your life outside of football is very important. Don’t forget about friendships outside of football and focus on your education. Have a plan for after college and use football to help you get there. 6. If you could give ONE bit of advice to the current Rubio Long Snapping PARENTS, what would it be? Never want something more than your kid does. 7. When was the last time you snapped a ball and for what reason? Vegas XXVI. Next one will be XXVII. 8. If you could go back and play football in college again, would you go to the same school or a different one? Why? No doubt I would choose University of Washington again. I love Seattle and it’s an excellent school. 9. Any regrets during college? Something you wish you had done or maybe hadn’t? Aim lower on my first snap at BYU. Sailing it for a safety with my parents in the stands was pretty embarrassing. 10. What tremendous thing have you been a part of or experienced since you graduated? Celebrating in the streets of downtown Seattle after the Seahawks won Super Bowl 48. That was tremendous. Brendan Lopez and Rubio at VEGAS XXV. 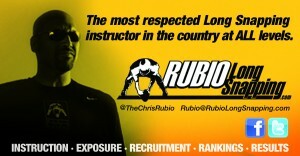 Lopez does a great job running Rubio Long Snapping lessons in the Seattle, WA area. For the next installment of “Where Are They Now?” we venture to Colorado to hear from Rubio Long Snapper Corey Adams. Corey was the #1 Long Snapper for Rubio Long Snapping in 2007 and has some of the quickest hands you will see. 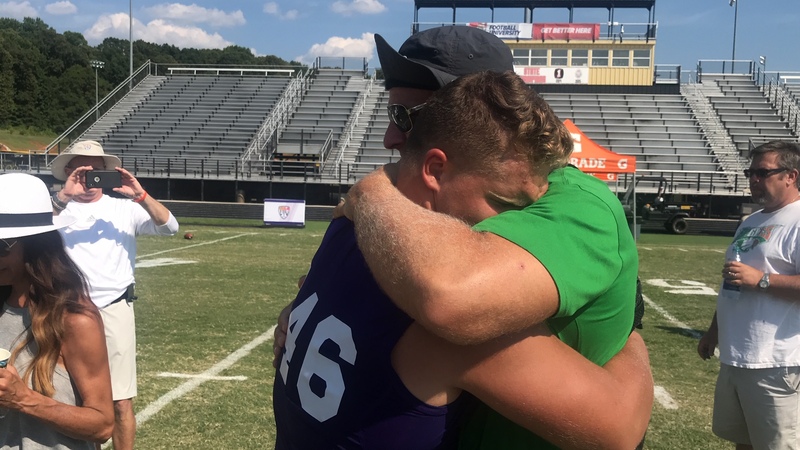 Incredible Long Snapper and an even better person. Check out what has been going on with Rubio Long Snapper Corey Adams…. 1. What is your current occupation? I currently work as a financial analyst at Lockheed Martin and as a Rubio Long Snapping staff member in CO.
2. Where do you live? Colorado Springs, CO.
3. Married/ Kids? Married to my wife, Karrington, for two and a half years. We are expecting our first child any day now. 4. What is your fondest memory of your time playing college football? My fondest memory from playing college football would probably be my very first game my freshman year. We were playing down at Auburn, in front of 90,000+ fans, plus a national TV audience. My high school team was really bad, and I think the biggest crowd we played in front of was MAYBE 1,000 people. Plus, Auburn’s stadium was about three times the size of my hometown, so getting to play in front of that many people for my first college game was pretty memorable. Also, all the time spent with all the guys on the team. Whether it was workouts, class, practice or study table, it was a just always a good time getting to hang out with them. 5. If you could give ONE bit of advice to the current Rubio Long Snappers, what would it be? The one bit of advice I would give to Rubio Long Snappers would be to not have any regrets. The very first team meeting at Kansas State, one of our seniors stood up and told us freshman “The days are long but the years are short”. 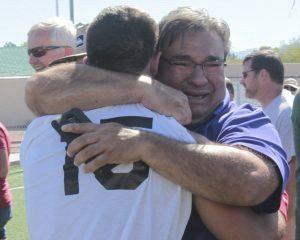 We all thought he was crazy and upset his time was almost up, but before we knew it, we were playing our last game together. That being said, whether it is a homework assignment/test, practice, workout, or just time with your friends/family, do not take any of it for granted; put 100% effort in and enjoy every second because once it is all over, you will miss it. 6. If you could give ONE bit of advice to the current Rubio Long Snapping PARENTS, what would it be? The one piece of advice i would give to Rubio Long Snapping parents would be to support your son when needed, but also give him the space to grow. I know there were times growing up when I was snapping with my Dad, and he knew exactly how to judge when to get on my case about snapping harder, lock my legs out etc, or give me my space to get something figured out on my own. Also, when your son is getting ready to transition from High School to College, be there to support him in any decisions he has to make, but give him the space to make his own decisions and speak to the coaching staffs on his own. This transition isn’t always going to be smooth, but at that time of anyone lives is critical to advancing in life. 7. When was the last time you snapped a ball and for what reason? Last time I snapped a football was the Pro/College demo at Vegas XXVI. It was the first one I had snapped in a while, and my form wasn’t what you would call “good”. Rubio texted me a picture of how bad it was, and since then I would like to consider myself retired, until the urge comes up to snap next Vegas. 8. If you could go back and play football in college again, would you go to the same school or a different one? Why? If i was going back and playing college football again, no doubt in my mind I would pick Kansas State. I loved the small town feel and all the support for the football program. I was able to meet my wife there, and have made so many life long friends, I couldn’t see myself playing anywhere else. 9. Any regrets during college? Something you wish you had done or maybe hadn’t? I really don’t have any regrets from college. I was able to get my degree, had the opportunity to play in the NFL, and was able to find a good job once it was all said and done. 10. What tremendous thing have you been a part of or experienced since you graduated? The coolest thing I have experienced since graduating (probably going to sound geeky) is getting to learn/work with some of the technology that our Department of Defense develops and uses. Some of the things seem like they would be made for a movie and are pretty unimaginable. It’s just neat to know the advancements we are making in those fields. Be sure to check out the link below to see a news story on Corey when he was just coming out of high school.